If you watch the trailers for Gringo and go in expecting the zany, laugh-a-minute comedy that they seem to promise, then chances are you’ll be somewhat disappointed with it not exactly being the movie it was sold as. That should not be surprising, after all it’s a common trait amongst certain trailers that they lure you in with a somewhat misleading tone, only for the film proper to be almost nothing like how it was advertised; Gringo is just one of many films that have turned out to be vastly different than the promos made it out to look, and sadly it’s also a case of the trailer being more memorable and focused than the actual movie. 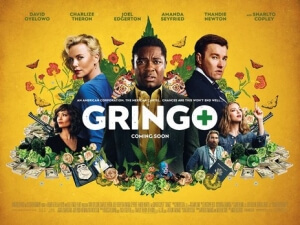 Directed by Nash Edgerton in his film debut, the main character is Harold Soyinka (David Oyelowo), whose life is less than stellar; he’s heavily in debt, he’s miserable in his job at a pharmaceutical company, his wife (Thandie Newton) is having an affair, and to make matters worse he’s heard rumours of a merger at work which could put him out of a job. When he accompanies his bosses Richard (Joel Edgerton, Nash’s brother) and Elaine (Charlize Theron, who is also one of the film’s producers) to Mexico on a work trip, he is finally pushed to the edge and attempts to fake a kidnapping and con his bosses out of a large amount of money for the ransom. Unfortunately, that just sets the stage for a whole bunch of crazy escapades to follow right after, which involve the Mexican cartel, a drug-smuggling sub-plot, and a conflicted mercenary (Sharlto Copley) who’s sent in to “rescue” Harold. It’s the kind of movie that you can tell whoever wrote it was a huge fan of the Coen Brothers, specifically Fargo with a little bit of The Big Lebowski thrown in there as well, but with their own script couldn’t quite match the tone nor the whip-smart stabs at dark comedy that they were able to achieve. It’s something of a jumbled mess, with several plots and characters vying for screen time instead of working together to create a cohesive whole. There’s an entire sub-plot with Amanda Seyfried travelling to Mexico with her boyfriend (Harry Treadaway), who is really there as part of a drug-smuggling sting, that could be cut out of the entire movie and nothing would be amiss; the same can be said with Thandie Newton’s character, who is largely wasted in a role that serves as a punchline, and a rather cruel one at that (her final scene in the movie, given what we know about her past, is somewhat mean-spirited), which again could easily be gone from this movie without a whole lot of impact on the rest of the plot. All these jumbled-together scenes, characters and plots make for an unbalanced tone that makes it difficult to figure out what exactly they’re trying to say with all of this, and it’s hard to really enjoy it when you’re constantly trying to solve this surprisingly complex puzzle. As tonally mismatched and overly stuffed as it is, there are a few good things I can say about this film. For one, you can tell that the actors are having fun here, playing these wildly exaggerated and subtly over-the-top parts; Oyelowo isn’t playing a hugely comedic role as the trailer suggests, but he is still a good actor who can sell the more intense and dramatic moments while also finding moments to be funny and charming; it’s great seeing Edgerton be such a sleazebag boss on-screen, but even better seeing Theron as this viscious, snarky and gloriously cynical wench who gets many of the film’s best lines; and Copley is great as probably the standout character of this film, a former mercenary turned aid relief worker who has noble but warped intentions with his share of the proposed ransom money. Nash Edgerton directs the movie just fine, and he clearly knows how to stage a scene and build suspense, but it just so happens that he’s working with a script that could have used another polish or two to get the focus just right. While I can’t say that I disliked this film overall, as again there are some good performances and as a debut director Edgerton does just fine, it’s a somewhat disappointing experience going into a film with promises of a madcap and zany comedy and then getting a tonally misjudged and overstuffed thriller with comedic elements. I can’t really be that mad because trailers have been doing this ever since they were first invented, but when the trailer you put out is better than the movie it’s advertising, it’s a severe sign that your film is sorely lacking in almost every other way. Gringo is a disappointingly mediocre comedy-thriller with an overstuffed script and an inconsistent tone, although there are a few memorable performances by an ensemble that’s clearly having fun with this material.